I had thought I would write one last essay on football. Maybe contrasting the modern game of celebrity stars to the far less celebrity of D III football. I would call our football celebrities “matinee idols”, but the NFL and the NCAA sell us our modern day heroes not just on weekend afternoons. Nearly every night in prime time on some channel you can find a football game. I had many fleeting thoughts as I watched this football season, one unlike any other. I mulled over what I would write as an end note to this long journey. On Saturday, I discovered my son Alex had written it for me. At Knox after the last game with the team gathered in the after game huddle each Senior gives a short speech to the team and gathered parents. 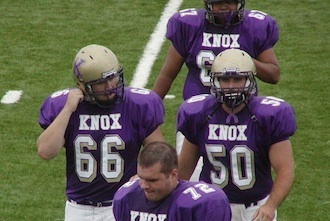 Knox’s last game is always with Monmouth College. The schools are 16 miles apart and have been meeting in the annual rivalry since 1888. Knox Monmouth Turkey Bowl Alex gave a touching speech from a note card he had carried inside his girdle pads the entire game. He wasn’t sure what condition the card would be in at the end of the game, but it was in tact if somewhat wrinkled. I will try to reproduce his words. 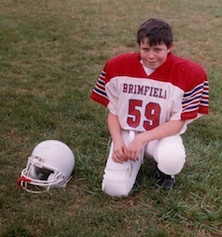 I have played football for fourteen years starting with flag football at a YMCA. 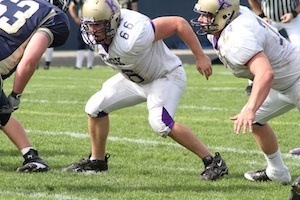 When the coaches asked me what I wanted to play on the team, I said O Line. They liked me because every other kid wanted to be the quarterback. They even designed a play called the right guard reverse. I don’t think it is legal in college rules, but I scored an 80 yd touchdown. I have never been given the ball again. Just a note I am ending football with an 80 yard per carry average. I thank God,, for giving me the opportunity to have played football. I don’t know how to adjust to life without football; it has been so much a part of my life even in the off-season. It is the only sport I love. I want to encourage all of you returning players to work hard. I believe you have the ability to turn this team into a conference champion. When I was a Freshman Coach Gibbons asked me to return to the O Line. I only weighed 205 pounds, but I worked hard for four years and have added 20 pounds of muscle. It takes work in the weight room, so stay dedicated year round. Believe in the new offense, dedicate yourselves to the team, and you will make it a success. Enough of the lecture, I want thank Coach Bonstead he was offensive line coach when I was a Freshman and again when I was a Senior. No matter how good a block you have he can always find something wrong with it. Coach Eisele called me when I was negotiating with admissions over the cost of coming to Knox, I had better offers from other colleges, twenty minutes later admissions called back willing to almost match the other offers. I want to thank him for that, I have loved being here at Knox. I want to thank my grandparents and parents for supporting me in many ways. They have given me a lot of money to attend this college and not be overwhelmed with debt. They come to all my games here at Knox. I want thank my father, he has come to every game from JFL to college. He even came to one game in spite of having his appendix removed. I am not sure how much he remembers of that game. I think he was still groggy that night. Football has always been our special relationship. Thank you to everyone who has given me this opportunity, work hard and believe. Alex came over to me; we gave each other a big hug. It is a big hug when you reach around his shoulder pads. He hugged his mother and grandmother and stood beside us as we listened to the last of the Seniors. The team gathered for the final break out, I walked back up to the top of the bowl and watched number 66 as he walked off the field turf for the last time. I loaded our bag chairs and took the family over to the pizza place near campus where we had decided to meet. My son Erik was joining us, Erik is a graduate of Monmouth. I drove back to meet Alex. I parked the car over by his house; I decided I had time to walk over to the gym to meet him on the way out. We live close to the high school and I had waited and walked home with him after every high school game, except the night of my release after the appendix operation. Alex came out and was going to hug me; I reached up and clasped his shoulder as he did mine. I didn't want to cry again. I said, “ I thought I would take one last walk with you.” He nodded. We talked about the game as we always have. He said a junior linebacker for Monmouth when there was a break in the game had walked over and asked who were Seniors and congratulated all of them on their dedication to the game. Alex said their greatest rival had shown the best sportsmanship of any team they had played. but he worked every day to help his team win, protect his teammates, and earn the respect of those who lined up against him. He still thanks God, he got to play football. Alex and I still have a special relationship, as we close this book and begin a new one. I will repeat my words from four years ago. So, this year the team was not perfect, nor was Alex perfect on every play. He is a son any parent would be proud of and that is perfect enough.